When we hear Madhuri, what comes to our mind is calm quiet, sweet, beautiful and amazing dancer. Madhuri Dixit, the Dhak Dhak girl has marked her identity as a beautiful dancer and mind blowing actress. Currently Madhuri appeared in most of the Award functions, when announced her name, every one, fix their eyes on the stage to see the beauty performance. Time put no end to her charm which grows day by day made her more beautiful. Her expressions, smile, style and of course her acting make her a complete entertainment package for any film. Madhuri first opened her eyes in the lap of Shri Shankar and Snehlata Dixit on 15th May, 1967. She got birth in a Marathi Hindu family of Mumbai, Maharashtra. Like her nickname is Bubbly, she is also bubbly in her nature. She has two sisters Rupa and Bharti and one brother Ajit. Madhuri went to Divine Child High School and Mumbai University to study microbiologist. She is a trained Kathak Dancer. On October 17th, 1999 Madhuri Dixit married to Dr. Shriram Madhav Nene. Mr. Nene is a cardiovascular surgeon practicing in Denver. Last year the Nene family settled in Mumbai, India. Madhuri is a mother of two sweet boys Arin and Raayan and wanted to enrich her children with Indian Culture, so they returned back to India. She started her career with the film Abodh in 1984 and Swati (1986) but didn’t get much notice. She attained stardom through film Tezaab (1988) and still famous for her dance on Ek do teen. 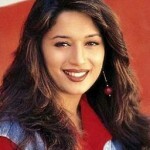 Some of her box office hits are Dil (1990), Saajan (1991), Beta (1992), Hum Aapke Hain Kaun…! (1994) and Raja (1995). After a short break, she gave a romantic hit film Dil To Pagal Hai (1997) and received critics for films like Mrityudand (1997), Pukar (2000), Lajja (2001) and Devdas (2002). After Raja (1995), her career went into slump but she regained her position with the role of Pooja played in Dil To Pagal Hai. This role by Madhuri made a benchmark in the film industry. Her name has taken as the synonym for the dance. Her flawless dance in the movie proved that she can perform any dance style and she is a versatile dancer. In 2002, she took a long break for her family and comeback with Aaja Nachle in 2007. She is a fabulous actress and also a good singer and marvelous dancer. She was hired as a playback singer in Wajood and Devdas. Famous painter M.F.Hussain cogitates her acting and decided to give her a tribute and made a film Gaja Gamini starring Dixit herself. The painter has watched her movie Hum apke hain kaun for about 67 times and on the release of Aaja Nachle, he booked the whole theatre. Her dances made her more popular. Some of her popular dance numbers are “Ek Do Teen” (Tezaab), “Chane Ke Khet Mein” (Anjaam), “Didi Tera Devar Deewana” (Hum Aapke Hain Kaun…! ), “Choli Ke Peechhe” (Khalnayak), “Akhiyan Milaun” (Raja), “Mera Piya Ghar Aaya” (Yaraana), “Kay Sera Sera” (Pukar) and “Maar Daala” (Devdas). In 2001, she won Rs.50,00,000 on first season of popular game show Kaun Banega Crorepati and donated that amount for people affected from natural calamities. Madhuri worked on television also. She hosted a Match – Making Show named Kahina Kahi Koi Hai in 2002. She continues making guest appearences on TV through various shows like Koffee with Karan, Nach Baliye. In 2011, she judged a dance reality show Jhalak Dikhhla Jaa-Season- 4 with co-judges Remo D’souza and Malaika Arora Khan. Madhuri can be watched on the new TV channel Life Ok in between different shows. On Women’s International Day in 2007, Madhuri ranked first in Rediff’s list, the Best Bollywood Actresses Ever. In 2008, Indian Film Festival gave her a tribute at Los Angeles. In 2010, The Economic Times included Madhuri Dixit in 33 women who made India proud. Rediff.com named her in top 10 “Readers Choice: The Greatest Actresses of all time” in 2011. Pandit Birju Maharaj, a Popular Kathak dancer, choreographer of Madhuri in the film Devdas called her as the best versatile dancer of Bollywood. 2001: Forbes named Dixit among the Top Five Most Powerful Indian Movie Stars. 2008: Padma Shri, India’s fourth highest civilian award by the Government of India. 2012: Madhuri Dixit will be waxed at the London’s Madame Tussauds. 1994: Screen Award for Best Actress for Hum Aapke Hain Kaun…! 1995: Filmfare Best Actress Award for Hum Aapke Hain Kaun…!